Maigret Enjoys Himself, Penguin’s English translation of Simenon’s Maigret s’amuse, will be available through Amazon.co.uk as of December 7, 2017. Both paperback and Kindle editions are being released. Because the paperback edition will not be available from Amazon.com until July 3, 2018, the opportunity for early delivery from the UK to the USA will appeal to some. Notably, the Kindle edition will be available December 7, 2017. As well, December 7, 2017 holds as the release date from the following other Amazon sources:Australia Kindle; Brazil Kindle; Canada Kindle; France Kindle; Germany paperback and Kindle; India Kindle; Italy paperback and Kindle; Mexico Kindle; Netherlands Kindle; Spain paperback and Kindle. Unfortunately, the later July 3, 2018 release date pertains to these remaining Amazon sources: Canada paperback; China paperback; France paperback; India paperback; Japan paperback and Kindle; Mexico paperback. Be aware the ISBN-13 for this new edition is 978-0141985879, which should facilitate searching for the book from various other sources. Maigret s’amuse originally appeared in 1957. It came out in English translation that same year as Maigret’s Little Joke with eight subsequent re-editions, three of which were entitled None of Maigret’s Business. The translator for those was Richard Brain, and the translator for this new Penguin edition is David Watson. The original work was the 78°in Simenon’s order of publication, and this work is the 50° in Penguin’s modern series of translations. This novel is interesting because it has an atypical and novel plot line. 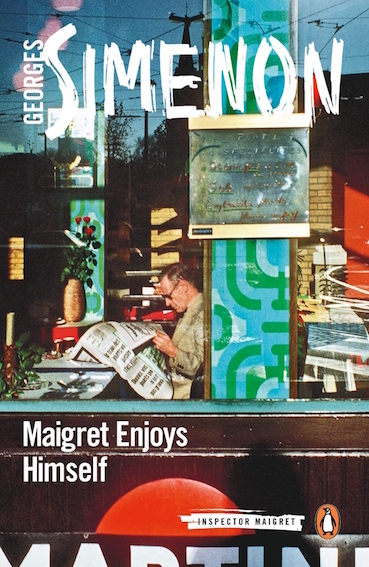 Maigret goes on a two-week vacation, but he actually never leaves Paris. He spends lots of pleasant leisure time with Mme Maigret, and so one learns a lot about the two. At the same time, showing just how much he needs to work as a policeman, the Chief Inspector avidly follows a murder case by reading newspaper accounts and cleverly guides the investigation by sending anonymous notes to Janvier, whom he has left in charge.